Bundle your adorable companion in this soft and snuggly designer dog sweater whenever the weather changes. The beautiful pink stripes are nicely scattered in the creamy white background to make this sweater a great choice for the cutest princess in your family. To complete the look and add exquisite style, our design intended to trim the neck, bottom and leg straps with high quality knitting, making it different from regular mass-manufactured sweaters. 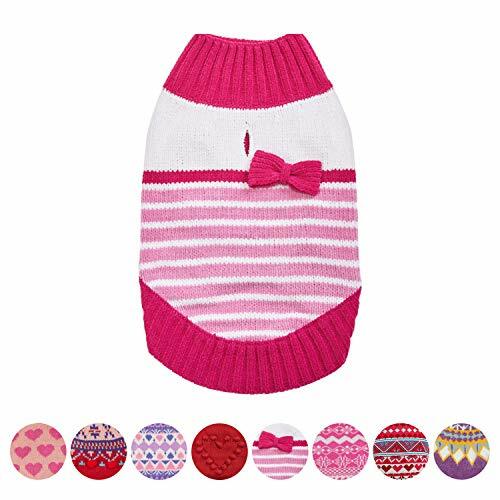 This sweater is a brilliant choice to any pooch's wardrobe because it is super soft to the touch and with the cute bow décor! In a nutshell, it is great for everyday wear, holiday parties and even for photo shootings.